The Berkman Center starts its tenth anniversary celebration with a wonderful gift. Congratulations! Google risks being distracted by technology rather than being focused on advertising revenue, the lifeblood of both Internet players, Boerries said. Boerries is Marco Boerries, Yahoo! 's SVP of "Connected Life" and he meant that as a criticism. I am glad that Google is not just "distracted" by technology but instead focused on it and above all the user benefits it can bring. I know that many at Yahoo! feel the same way about their innovative company and I assume that Boerries was either misquoted (it isn't even really a direct quotation), taken out of context or misspoke. Also, focusing on "advertising revenue" seems to incorrectly describe what both our companies do (I hope). Focusing on value for advertisers might be a better way to understand it. Lots of fun discussion about alternative (random) ways of ranking law schools. I like these discussions because I've never been a fan of law school rankings, so the more the merrier. Paul Caron (a tax law professor at University of Cincinnati) gives a ranked list based on a Google search for "law school." Mike Madison passes along Al Brophy's suggestion to rerun the search as ""law school" OR "school of law" OR "college of law" OR "law center" site:.edu" which changes the results. Here's another of just five. The image above shows a graph of number of searches for five of the schools on Google (from Google Trends). If you click on the image, you'll go to the Google Trends page of the search and be able to see more info and play around with some of the variables. Oh, and U.S. News and World Report also has a ranking. 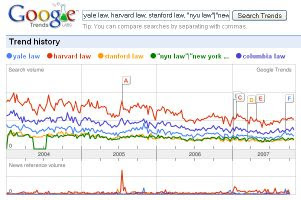 BTW, in case you come from a law school that did well in the Google Trends ranking, this one may be sobering. That's searches for jd versus mba. Hat tip to Siva, from whose blog I first read about this (though I really don't endorse that blog or his habit of copying the entirety of the blog posts he links to). In his new position, Crews will advise on the application of copyright policies to teaching, research, and scholarly communication within the University. His responsibilities will include educating faculty, staff, and students about copyright through web-based information, publications, training programs, and conferences. Two smart library folk. Glad that I'll get to hear them more.